Did you know that I am a weight loss blogger? Neither did I, until seeing this article in the Times. First off, I am happy to see that the New York Times has finally gotten wind of one of the best kept secrets in real authentic North African cuisine in New York City, which is made at Tudor Cafe by my friends Chefs Abduhlghani al Jahmi and Yassine Boutemedjet. They were the first to prepare Hashi Mashi for me, a great breakfast, lunch or dinner, for anyone wanting to lose weight and get fit. Today, over a quarter of a million people have visited HMT (Hashi Mashi Training), to be accurate, 273,687 as of today, May 12th 2017, and are benefiting from the information in HMT to improve their own health and fitness, whether they trying to lose weight and get fit, fight depression, deal with divorce and/or other loss. For that, I am grateful and hope to be able to help inform, educate and/or motivate many more who want to lose weight and get fit. If I, a cookie monster, carb addict, obese middle aged guy, could improve my own health & fitness, I know that you can, start your own health & fitness transformation today! Tudor Café, in the quiet, garden-laden slice of Midtown called Tudor City, seems like another run-of-the-mill sandwich place until you slow down and take it all in. First, there is the specials board outside 5 Tudor City Place, which lists North African comfort food like chicken tagine, Algerian couscous and Moroccan harira soup. Inside, the tiny space is as vibrant as its bright orange walls and eclectic art. Spotted recently: a young Nordic-looking couple with suitcases who looked to be falling in love were perched on stools by the window; a middle-aged woman in a tailored trench coat discussing politics (in French) with both the man at the counter and the customer behind her; a building superintendent devouring a sandwich in the corner, yet waving to everyone coming and going. There is a homey, lived-in feel here. After all, a co-owner, Abdulghani al Jahmi, has been in charge for 18 years. “We’ve seen kids of customers grow up, and customers have seen our kids grow up,” said Mr. Jahmi, 42, who opened the shop with his father in 1996. 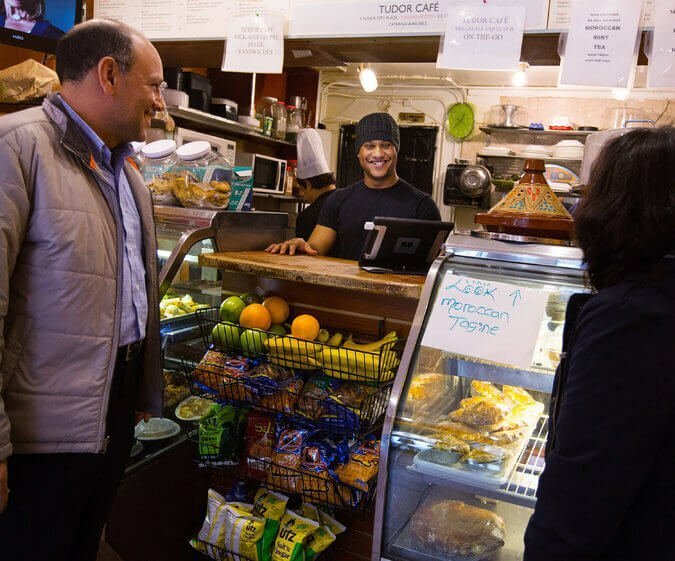 The evolution of Tudor Café from a basic deli to a community outpost of fine food can partly be credited to Mr. Jahmi’s graduation from culinary school in 2005 and his experience opening Bab al Yemen, a Yemeni restaurant in Bay Ridge, Brooklyn, with his brother, Waleed, in 2010. It was very well received but, as with most restaurants in New York, it ultimately closed. Another factor in Tudor Café's development is the 10-year partnership between Mr. Jahmi and Yassine Boutemedjet, 49, an Algerian-born, French-bred former customer, that has made the business blossom. “I used to come in here for my coffee,” said Mr. Boutemedjet, who is now a co-owner. “We didn’t get along when we first met.” “He had a little French attitude on him,” Mr. Jahmi recalled. Soon, however, Mr. Boutemedjet, who was working for Little Pie Company at the time, started helping Mr. Jahmi in the kitchen. He introduced potpies and quiches to the menu, and encouraged Mr. Jahmi to prepare heartier, more interesting dishes. And lots more sweets. “They always have some sort of interesting surprise,” said Jennifer Boral, a real estate agent who lives and works in the neighborhood and who had recently picked up some soup for a housebound friend. 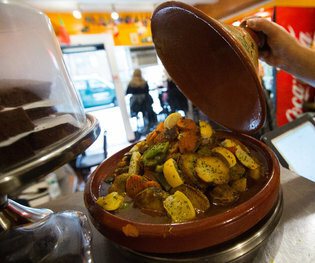 In Tudor City, Ms. Boral said, “we all have these Pullman kitchens, you know, so that’s why it’s very important that we have this hot fresh food next door.” Some neighbors even bring their hot meals home in traditional Moroccan tagine pots (as long as they return them, clean). In addition to nearby residents, Mr. Boutemedjet said, Midtown office workers and United Nations dignitaries come to the cafe. “We used to have a guy who was No. 2 in the U.N., a French guy. He used to come here and eat couscous,” Mr. Boutemedjet said. “And one day I was watching CNN, and it was him!” But it is the neighbors who seem to benefit the most. “We see them every morning and we know their coffee,” Mr. Jahmi said. Weight Loss Blogger – Who Knew? “They have very good espresso, and the croissants, it’s a treat,” said Sylvie Beljanski, a French businesswoman who lives next door. 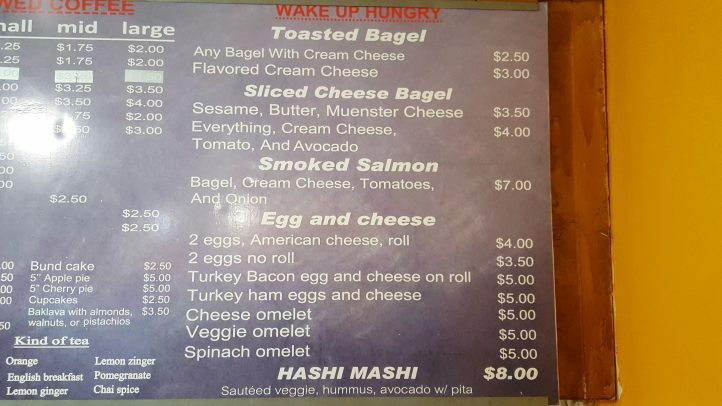 Other regulars, according to the owners, include a character actor known for playing menacing underworld types, and a weight loss blogger who calls himself Hashi Mashi. The name comes from an egg white dish that had been prepared for him at the cafe on a regular basis while he was adjusting his diet. The selection is now permanently on the menu in his honor. 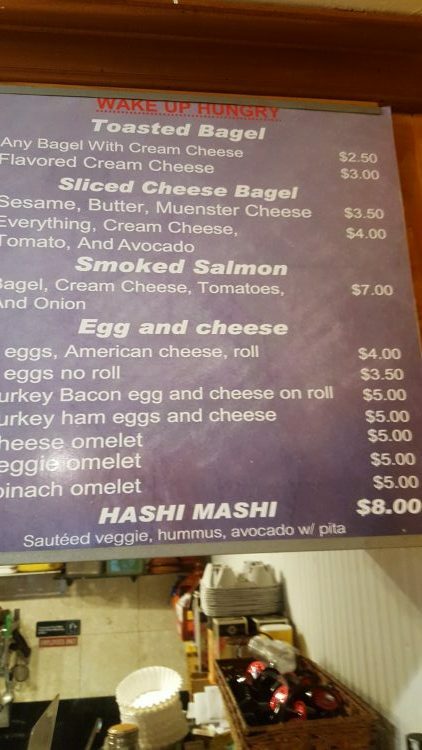 For the longer version of how I originally created the Hashi Mashi Training program that helped me lose over 75 pounds of weight in 6 months and get fitter than I ever thought possible, check out the post Just Who and What is Hashi Mashi?